this was making its way around facebook with a different message. i modified it. the lesson is still the same. What ever happened to kids going outside and playing? Exactly true. Especially when the media came out and stated from the beginning that he used a Bushmaster 223 AR 15 in the Ct shootings. Recently on FB NRA issued a note that it was NOT a Bushmaster used in CT but a common rifle that was left in the car. I felt it was fishy from the beginning of how he could use a Bushmaster for the shootings when the long gun was found in the car! the media has become so sensationalistic. remember the shark attacks, and how every shark that came close to a beach made the news? its the exact same thing. it’s not a conservative vs liberal thing either. 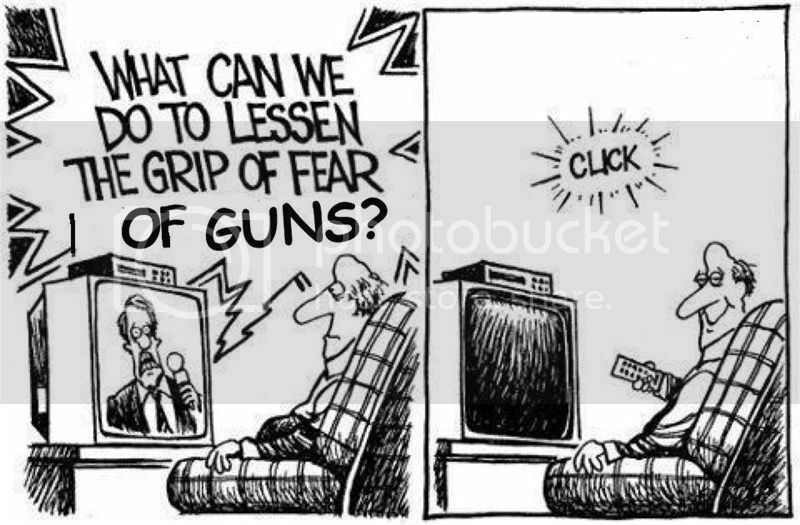 maybe fox news isnt quite so damning about guns, but they ALL do it. news has become a business so they will do ANYTHING to sell a story, and fear sells. Cutting off cable and satellite and internet would do a lot to cut through the shrill media hype. I would love to see what a 3 month(longer the better) boycott of these would do. I think ‘main stream America’ would get a lot more respect if we did. Hunting shows that promote the wrong way would be gone. MSNBC probably would fold as Comcast might not afford them. Subscription TV might go al a carte to ‘invite’ us back. Meaning you could pick just those channels you want. Internet might ‘magically’ get cheaper. Journalism might refocus on the facts. Politicians would no longer have big media to back them. Imagine the quick 180 degree shift if we ditch them if they attempt to ‘rework’ the 2A. Perhaps I too have a case of wishful thinking. We can only hope for such a day! Reality TV gone? How great would that be?!!! The rest sounds good too but I hate reality tv!!!! Too many Coors lights for the Freak! LOL. i figured it was either that, or auto correct of a phone. i was just givin ya a hard time. do you know why we’ll never see the end of reality shows? they are cheap to make. no actors. no writers. no set. it’s just another way for cable television to screw you. There’s nothing “real” about reality TV. I shot a few episodes for MTV and VH-1 and it’s all a set up. No script, but close. It’s easy to get white trash to say exactly what you want them to say. Almost as easy as it is to get them to start a fight.